﻿﻿Thinking about selling your home this year? What are you doing right now to be successful? You might be planning on some new paint, maybe considering getting your carpets cleaned or replaced, and there's a strong chance you need to spruce up the flower beds. Hopefully you are also interviewing Realtors so that your listing is professional and your home sells quickly for top dollar. So you get that contract from a buyer, and you are ready to move. Except for one small step - the inspections. Home and termite inspections are accounted for in the Oklahoma Real Estate Commission's standard purchase contract, and most buyers have them done. This can be an extremely stressful time for both buyers and sellers as everyone waits to find out if any major problems (deal breakers) will show up. If there are unexpected issues that cannot be negotiated, the buyer has the right to cancel the purchase contract without penalty. Why wait to see if there are problems? You can know what they are going to find by getting there first. It allows you to see your home through the eyes of an objective and neutral third party. 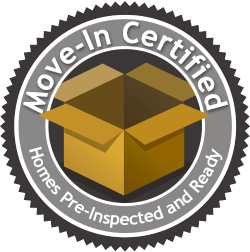 A Move-In Certified® Seller Inspection is the ultimate gesture in forthrightness on your part. Don't let the unknowns prevent you from selling your home for top dollar. Schedule your inspection today, and get sold!